As a wrap-up to Local Food Month, and in conjunction to finishing reading The Omnivore's Dilemma, I proposed trying to create The Perfect Meal. Unfortunately, I never did get around to actually hunting, collecting or harvesting all my own food, so I let it slide. But last night I think I got about as close to the Perfect Meal as I'm going to get. 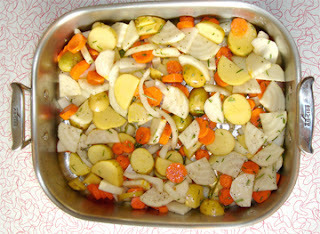 It was Sunday Family Meal night and I harvested from my backyard potatoes, beets, carrots, onions, garlic and rosemary for a roasted vegetable dish. I also oven roasted locally grown corn and made (if I do say so myself) some absolutely fantastic Rioja braised chicken thighs (from local, organic chicken) with a plum port sauce, using the Plum Port jam I made last month. I still can't get over how crazy good my creation turned out. I can't wait for leftovers tomorrow. Let me know if you are interested in the recipe and I'll post it on Crunchy Chicken Cooks. I also wanted to let you all know that Joel Salatin (of Polyface Farms - the farm featured in The Omnivore's Dilemma) has a new book coming out. He was kind enough to send me an advance copy, so I'll be posting a review when it's closer to the book's publishing date. Between that and Animal, Vegetable, Miracle, I'm in food reading heaven! I actually roasted veg this weekend, cooked eggplant, and made stuffed peppers. Huge accomplishment. I am also reading away at Animal, Vegetable, Miracle (which also contributed to my cooking episode, but you are the one that has me reading that too!) and I didn't get much else done as I sat and read the damn book because I can't put it down! Also, I was wondering if you could touch on plants that we can grow in the fall/winter in our garden. I am in zone 7, which is probably pretty close to the zone you are in. I've never tried to do so, but maybe you know how!